North Oak Medical Park consists of a 135,000 square foot multi-phase, four building medical office park located on 12.33 acres in Kansas City, Missouri. The first phase of the project, a 61,000 square foot building was completed in April 1995. The second phase of the project, a 25,000 square foot building was completed in February 1999. 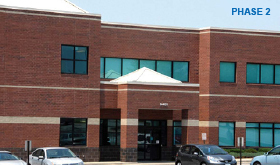 Phase III consisting of 36,000 square feet of medical office suites was completed in April 2004. Phase IV is in progress. Principals of US Federal Properties (“USFP”) are investors in Phase III of the park. Gashland Clinic, the majority owner of the park, selected USFP as the development agent. USFP was responsible for site selection and negotiating the terms of the land acquisition. USFP also served as the project manager and leasing agent and was responsible for all aspects of the bidding, construction management, leasing, financing, and property management for the assets. The park was awarded the Key Stone Recognition award by the Clay County Economic Development Council for its commitment to the business expansion base for Clay County.